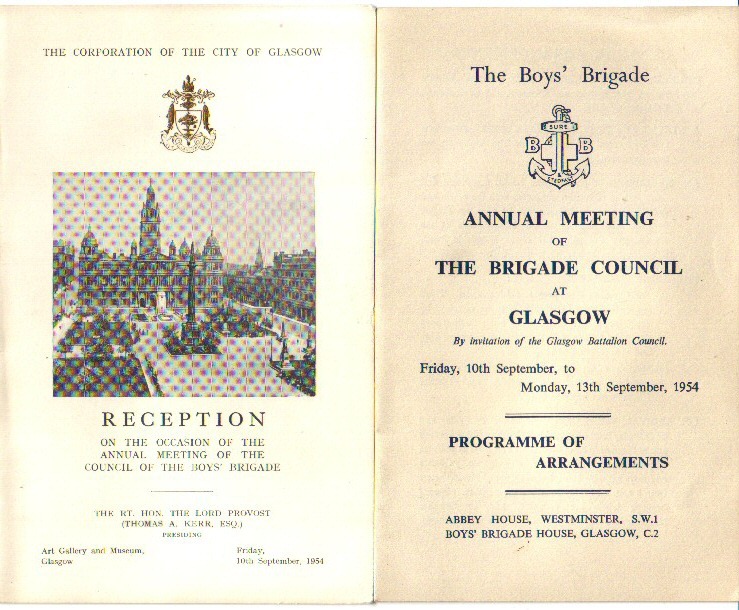 The Boys' Brigade Annual Meeting of The Brigade Council was held in Glasgow, Sept. 1954. Council headquarters were at Boys' Brigade House, 168 Bath St. Glasgow C2. A stall for the display and sale of BB publications was open at Glasgow University. An Exhibition of photographs, books, equipment and other articles of interest connected with the origin and development of the Brigade was held at the headquarters of the 1st Glasgow Company, 329 North Woodside Road, Glasgow. On arrival visiting officers were met at railway stations, bus terminals and steamer wharfs by Officers and Boys in uniform. Hostels...Officers living in hostels will be provided with bedding but were required to bring with them their own towels and soap.. Uniform ... was worn at the Civic Reception and at the Conventicle .... it was also requested that dark suits should be worn at The Tribute to the founder on Saturday afternoon, 11th Sept. "...I found these programmes at a garage sale in Adelaide and knowing of your great love of the BB I thought you may like to have them. I'll take this opportunity to thank you for your GlescaPals website, its wonderful to keep in touch with home in such a hands on way. I just love making new GlescaPals from the four corners of the earth... long may it flourish...."
Webmaister : Caltoncuddy very nice of you to send me these programmes.... a garage sale in Adelaide !!!! Incredible. Thanks Pal. Anyone have any information about this weekend?